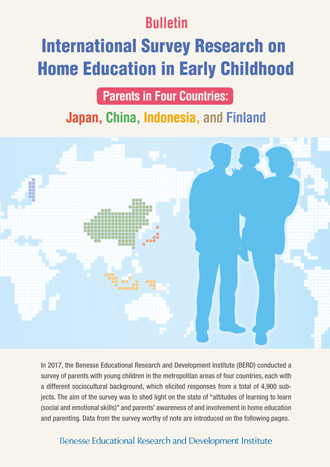 In 2017, the Benesse Educational Research and Development Institute (BERD) conducted a survey of parents with young children in the metropolitan areas of four countries, each with a different sociocultural background, which elicited responses from a total of 4,900 subjects. The aim of the survey was to shed light on the state of "attitudes of learning to learn (social and emotional skills)" and parents' awareness of and involvement in home education and parenting. Data from the survey worthy of note are introduced on the following pages.